Ultimately this proved a frustrating recital. It boasted many good thing, yet not only did they fail to come together as a convincing whole, but one also became aware of a number of artistic limitations, particularly with respect to Joshua Bell’s performance. Janáček’s violin sonata is, at the best of times, not an easy work to render coherent. Here, Bell often seemed to act more as a soloist than as a chamber musician, which, given his experience in the world of chamber music, came as something of a surprise. He looked at his partner, Jeremy Denk, far more when the violin was silent than when called upon to play, whereas Denk proved extremely attentive. There could be no faulting the technique of either musician but Bell was rather too ready, especially during the opening movement, to employ a seemingly all-purpose Romantic tone. Denk sounded more alert to the idiosyncrasies of the composer’s style. He provided a nicely rippling opening to the following Ballada. Though still somewhat on the Romantic side, Bell now seemed more sensitive to shifts of mood – and Romanticism is probably more appropriate to this movement in any case. Shades of Debussyan harmony were brought out, and with a good dose of passion rather than haze. The third movement was strongly characterised by fragments of distorted dance rhythms, reminiscent of the troika music in Katya Kabanova and looking forward also to the Sinfonietta. Bell’s double-stopping was flawless, although the music did not always seem to have penetrated under his skin. The fourth movement had a real sense of chamber music, the musical ‘lead’ passed between the instruments according to the imperatives of work and performance. I very much liked the musical question marks posed by the uncertain violin interventions, not least that with which the sonata ended. Denk provided arresting piano tremolos, igniting a passionate response from both musicians in an unsuccessful – which is as it should be – attempt to climax. The third of Brahms’s violin sonatas opened once again with an uncertainty of idiom. Denk’s role here was once again more impressive, presenting clear textures without loss to the piano part’s complex richness. By contrast, Bell’s tone often sounded inappropriately light. At home with the lyrical side of Brahms’s inspiration – Bell can certainly spin a long line – the reading often lacked depth, although the half-light of the first movement’s coda provided subtly menacing shadows. The following Adagio was presented as a song without words: not without a proto-Elgarian nobility but rarely penetrating to the intricacies of Brahms’s serial foreshadowings. The third movement fared better. Its ghostliness was possessed of an unusual serenity, albeit punctuated by truly Romantic outbursts. There was an almost Schumannesque schizophrenia, within certain bounds, rendering the scherzo more of a Romantic ‘character piece’, or perhaps dual character piece, than is usually the case. In the finale, Denk proved adept at reminding us of the echoes of the previous movement. Yet, here the welcome clarity he brought to his part was married to an undue lightness of tone. He sounded a little too Mendelssohnian. Bell’s rendition of the violin part was technically flawless but I wanted a greater rawness, if not of tone, then at least of emotion. Where Bell really did come into his own was in the solo Ysaÿe sonata. The opening Prélude brought forth immediate echoes of Bach, leading into a duly obsessive hearing of the Dies irae chant. The fascinating second movement, Malinconia, seemed somehow – and without taking the obvious route of eschewing vibrato – to evoke the mid-Baroque world of melancholy Affekt. There was nothing showy to Bell’s performance; indeed, it proved unfailingly musical. The Dies irae here sounded as if refracted through the evocation of a consort of viols. After the sweet pizzicato opening of the following Danse des ombres, there was again something intriguingly alte about the ensuing Musik, a splendid antidote to the glossiness of so many performances of such repertoire. The music then grew into something more Romantic, as if the listener were being taken on a guided tour of the history of the violin, with an appropriate nod to Paganini at the appropriate juncture. This led seamlessly into the final movement, Les Furies, in which Bell could prove himself the very model of a modern violin virtuoso, whilst hinting at a modernism, especially of harmony and its implications, often overlooked in the music of Ysaÿe. Franck’s sonata proved, like much of what had gone before, something of a curate’s egg. Denk imparted a surprisingly impressionistic tinge to his opening bars, the harmonies sounding stranger than usual. However, the first movement as a whole lacked the necessary security of harmonic direction, veering between those intriguing, if ultimately not quite convincing, hints of Debussy and a somewhat over-the-top Romanticism. One might well say that Franck’s elusive idiom lies somewhere in between the two; perhaps so, but it does not really lie in alternation between them. Bell’s violin often sounded disconnected from the piano part, not in the sense of a lack of synchronisation but rather as if he were playing to a pre-recorded ‘accompaniment’. The second movement opened with a wonderfully Tristan-esque bent to the melodic lines, to some extent prefigured before but now given fuller – and convincing – rein. Romanticism was spot on in this case, although the central section sounded, ironically, more like Brahms in D minor than much of Brahms in D minor had. I liked the improvisatory feeling to the beginning of the Recitative-Fantasia, evocative of the organist ‘preluding’ upon previous given themes. However, even at his most ardent, Bell’s lyricism was not really matched by sufficient depth of tone. If the musicians were not entirely able to mask the repetitive nature of Franck’s cyclical form here and in the finale, the fault is not really theirs. One again had a sense in the final movement of a soloist and accompanist rather than true chamber music. This was not entirely Bell’s fault, for there were times when Denk could have been rather less delicately reticent. As so often in this recital, the whole was not a great deal more than the sum of its variable parts. Having grown so used to disappointments in the opera house, the recent nadir having been Covent Garden’s Flying Dutchman, what a relief it was to encounter such a triumph, on the last night of its all too short run at the Coliseum. Let me get the odd gripe out of the way first. The English translation was, even of its kind, inadequate. Even with a better version, one would have missed the sound of Czech, its speech rhythms so fundamental to Janáček’s vision. It is testimony to the overall quality of the performance, however, that I soon ceased to care. And there were a few oddities about David Alden’s production. Some aspects of the updating to post-war Eastern Europe work better than others. The tarting up of the girls of the town – this does not seem to be even a modern rural community – is probably overdone. With the exception of the dowdier Jenůfa – she should have been a teacher, as Grandmother Buryja tells her – they all look like prostitutes. Perhaps a point is being made here concerning moral hypocrisy but there ought to have been better ways to do so. Nor did I understand why when, in the second act, Jenůfa prays to the Virgin Mary, she does not face the statue the production has provided for. It is not as if any point seemed to be made about turning away. The mayor and his wife seemed oddly portrayed in the final act, as though they really were part of some rural backwater; their caricatured vulgarity detracted from rather than intensified the drama. Laughter does not seem an appropriate reaction to what is taking place here. Musically, things were better still. I am not sure that I have ever heard the ENO orchestra on better form. This might have been a top-flight international orchestra, boasting considerable depth of tone and dramatic versatility. Special mention should go to leader, Janice Graham, whose crucial solos were well-nigh perfect, reminding us of at least the hope, however distant it might seem, of redemption. Clearly the orchestra was inspired, as it should have been, by the musical direction of Eivind Gullberg Jensen, who would in no sense be embarrassed by comparison with Bernard Haitink or Sir Charles Mackerras. Ever-responsive to the shifting demands of the score, there was true harshness, though never of the easily applied variety, to Jensen’s reading. The more Romantic passages were never unambiguously so, with the possible exception of the conclusion – although here, given what had happened, one could hardly forget. There was not one occasion on which I thought a transition hurried or a tempo-choice questionable. Orchestral balances, the opening brass excepted, were expertly handled too. This was my first encounter with Jensen’s work; I trust that it will not be my last. Jenůfa really seems to be Amanda Roocroft’s role. Dramatically credible, infinitely touching, almost invariably secure of tone, I could hardly believe this was the same singer I had seen a few years ago as Tatiana at Covent Garden. Where sometimes the Kostelnička might cast her daughter-in-law into the dramatic shadows, one never forgot here that the opera bears the name of its true heroine. Only if it is understood thus does the opera offer any true hope at all. That said, Michaela Martens was simply stunning as the Kostelnička. Less forbidding than one might expect, this was a compassionate woman throughout, driven by appalling circumstances to infanticide. Whatever the horrors of her deed, one never ceased to empathise with her predicament. The guilt it had imposed upon her by the beginning of the third act was almost overwhelming, even when one looked at her, let alone heard her. Susan Gorton offered a nicely observed grandmother, whilst Mairéad Buicke was a splendidly ghastly Karolka. Števa got what he deserved there. In that role, Tom Randle gave an all-encompassing performance. His stage and vocal alcohol-enhanced bravado in the first act prepared the way with utter credibility for the squirming weakling of the third. One could understand why all the girls wanted him – and not just for his money – but equally one could feel relieved that Jenůfa found Laca instead. Robert Brubaker’s portrayal of Laca was equally fine, movingly alert both to his essential simplicity and the somewhat paradoxical attendant complexities of his reactions. His journey from lovestruck petulance to true nobility of spirit was powerfully conveyed. This performance’s signal achievement was that not a single member of the audience could have been left in any doubt as to Jenůfa’s status as one of the greatest operas of the twentieth century. I do not know whether this were intentional, but I was sometimes moved to think of Janáček as a successor to Mussorgsky in terms of unsparing operatic realism. One cannot say much better than that. This fascinating programme was entitled ‘Bach Plus’. Three Bach concertos, two for violin and one for harpsichord, were joined by Berg’s Lyric Suite – the three movements arranged for string orchestra, not, as the programme notes implied, the original six for string quartet – and a mix of Bach and Kurtág: movements from the Art of Fugue and Signs, Games, and Messages. I was not entirely convinced by the ordering; to my ears, the second violin concerto sounded a bit too much like winding-down or even reversion, following the concentration of the Bach-Kurtág sequence. Nor could I discern why most of the players stood for the second half, having been seated for the first. But those are minor reservations, especially in a climate in which performances of Bach on modern instruments, save the works for piano solo, have become rare indeed. A slightly larger string ensemble (3.3.3.2.1) was assembled for the Berg. I had never heard it performed by chamber forces before. If ultimately, I prefer either a full orchestral string section or the quartet original, the members of the Britten Sinfonia proved able advocates for such a compromise, producing a commendably full tone at climaxes and successfully conveying more than an impression of Berg’s labyrinthine eroticism. I especially liked the way the stomping Ländler-rhythms forced their Mahlerian way into the opening movement. Jacqueline Shave abandoned her violin to conduct the second movement, which, given its complexities, seemed a wise choice, even though she did little other than beat time. The scurrying, insect-like sounds looked forward at times to Ligeti and even Xenakis, but the harmonies and triple-time lilt in the more ‘Romantic’ passages left us in no doubt that the composer was Berg. The last of the three movements Berg arranged attained just the right note of problematic redemption, the various reconciliations Berg attempted remaining fraught, if beguiling. It was here, above all, that I thought a fuller string section would have been of great benefit, but it is testimony to the quality of the performance that my doubts were never more than mere doubts. The quotation from Zemlinsky’s Lyric Symphony registered with heart-rending clarity. Strings were once again one-to-a-part for the first of Bach’s two violin concertos. A larger ensemble would probably have helped distinguish more clearly between soloist and ensemble but I suspect that the textures of a chamber-performance were desired rather than heard by default. Lightness and flexibility were the order of the day, at least earlier on. When it came to the finale, dance rhythms were aptly to the fore, but the music would have thrived more with greater flexibility; it sounded a little too ‘controlled’ by soloist Alina Ibragimova. There was a slight paradox here, for Ibragimova actually did very little as director. I had the feeling, especially during the slow movement – which could have done with being a little slower – that, conductorless as it was, the ‘orchestra’ would have benefited from a soloist more willing to lead it. Moreover, it was here that I felt the lack of great passion – and vibrato. Many of those reservations I would also feel in the performance of the second violin concerto, although here I discerned other difficulties too. For instance, whereas the first movement of the A minor concerto had commendably recognised the moderato part of the Allegro moderato tempo indication, that of the E major concerto was simply too fast. Just because one can play something at a faster tempo does not mean that one should. This movement was breathless rather than exciting, a problem compounded by Ibragimova’s Vivaldian approach to the more virtuosic passages. If Bach is a place for fireworks at all, then they should be of a different nature from this. Moreover, her tone, whilst sometimes leavened by freer use of vibrato, remained somewhat pallid. There were a few moments of less than perfect intonation too. The slow movement was lyrical, again in a rather Italianate way, but hints of the operatic aria are not inappropriate here. That said, there are depths that did not begin to be explored on this occasion. (One can listen to Busch, Oistrakh, Zukerman, etc., etc., to appreciate what might have been.) Rather to my surprise, the finale sounded less forced than the first movement. There were, however, once again some dubious solo Vivaldian histrionics to be endured. Much better were the Bach and Kurtág selections. I was far from enamoured with the vibrato-less tone adopted by the violins in the opening and closing Bach numbers (Contrapuctus I and V) but there was an intriguing echo of the viol consort, which somewhat alleviated my unease. It was only in these two movements that the full ensemble, itself in any case small, was employed. Kurtág’s Hommage à J.S.B. had a nice sense of ‘following on’ from Contrapunctus I. Written for violin, viola, and ’cello, its Webern-like concision made me wonder whether that composer might have been a still more appropriate candidate than Berg for inclusion in this programme. Caroline Dearnley’s ’cello solo movement, Népdalféle followed. In this excellent performance, Bach met Bartók and was yet transmuted into something quite new: slow and gravely beautiful. Bach returned for Contrapunctus VII, from string quartet. The counterpoint was presented rather than interpreted, but there is a case – even if I am not persuaded of it myself – for saying that it needs no more. Certainly the performance’s – and arguably the music’s – abstraction exerted their own fascination. Jelek VI returned us to the formation employed for the first of the Kurtág pieces. Here, however, there was a very real sense of violent outburst. Every note counted, once again recalling Webern. The viola solo of the following Panaszos nóta, performed ably by Clare Finnimore, sounded like a weird refraction of gypsy and traditional song through the instrument’s harmonics. It moved on towards a more conventionally Romantic sound, before turning to a combination of the two. It was haunting, unpredictable, yet with an inevitability all of its own. There was a certain weirdness of Bach’s own to Canon XIV, performed by violin and ’cello, both in terms of its chromaticism and the distance between the two musical lines. A sense of life ensured that it did not sound unduly didactic; indeed, I should have been quite happy to have heard Bach’s astounding canonical writing extended for hours. Mesmerising pizzicato and a real sense of fun characterised the Hommage à Ránki Györgi, followed by a virtuoso violin solo for Ibragimova in The Carenza Jig. It was here, I thought, that she sounded most at home, far more so than in Bach. Contrapuctus V then offered a welcome sense of culmination to a provocative and satisfying sequence. Daniele Gatti’s final London concert as Music Director of the Royal Philharmonic Orchestra presented, aptly enough, the symphonic swansongs of Mozart and Beethoven. There was much to recommend these performances but I wonder whether I was alone in wishing that he had bade farewell with his penultimate concert, a truly devastating performance of Mahler’s Ninth Symphony. The Jupiter symphony opened somewhat unpromisingly, with tentative violins, apparently unsure whether they should be aping ‘period’ manners, or rather mannerisms. However, such fears were banished once they began more freely using vibrato and adopting a wider range of dynamic contrasts, encouraged, it would seem, from the podium. The repeated exposition was much better than the first time around, the second subject presented with echt-Mozartian charm. Gatti imparted a strong rhythmic sense throughout, at times eliciting an almost Klemperer-like sturdiness to the bass line. Contrapuntal clarity and direction enabled one to understand that the contrapuntal miracle of the finale should not be viewed in isolation but as a culmination of the work. In the Andante cantabile, Gatti’s experience in opera doubtless assisted his shaping of long, vocal lines, although I have heard many ‘operatic’ conductors fail utterly in this respect. Phrases were carefully shaped, without fussiness. There was no nonsense about taking the music at breakneck speed; here one could bask in its utter loveliness. Sometimes, I wished that the strings would dig more deeply; there remained occasions when they sounded a little inhibited. The minuet was graceful, poised, and possessed of a nice swing. It was taken at a gentle one-to-a-bar but was not rushed. Phrases clearly answered one another, something which ought to go without saying but sadly not. The trio was also nicely swung, its minor-key episode making its presence felt without standing out unduly. Again, the imitative phrases of the finale were presented as answering one another, adding to an admirable sense of freshness and vitality. Any inhibitions on the part of the string section were now banished, leading to an entirely convincing account of this movement. The contrapuntal nature of so much of the composer’s material was brought out, enabling – as I remarked with respect to the first movement – the miracle of the coda’s quintuple invertible counterpoint to register as a cumulative, climactic tour de force rather than simply appear, as a deus ex machina. The movement boasted a real sense of triumph: exciting yet always dignified. After the interval came the Ninth Symphony. (There is no need to say by whom.) Furtwängler has a lot to answer for here. A few months ago, I was talking to a distinguished philosopher and critic. We agreed that, after hearing Furtwängler, in whichever of his recorded accounts, no subsequent performance, not even Klemperer’s, matched up. One hopes against hope, of course, but nor did this, despite a number of musical virtues. The first movement was in many ways most impressive, certainly when compared with the general standard of what one hears today. Gatti’s reading certainly gave the sense, as Furtwängler did so unerringly, of hearing the music as a whole, but there were times when he might have yielded, which went for very little, if anything at all. Wind instruments – woodwind as well as the blazing brass – could readily be heard without any sacrifice to depth of string tone. The latter could never fool one into believing that one was hearing one of the great German orchestras but, for a London band, it was not bad at all. The clarity of contrapuntal writing that had marked the Mozart symphony was once again apparent here. If one considered the movement as a demonic and at time lyrical rather than metaphysical drama it worked well, but is this really what the Ninth should be? There was fury throughout and the development section evinced a sense of titanic struggle, but what does this mean? One might not be able to answer that with words – although it is arguable that Beethoven eventually tries to do so – but one should certainly try with music. The scherzo was fast, but energetic rather than mercilessly hard-driven. Matt Perry took his chance to shine on the kettledrums and ran with it, musically as well as theatrically. I felt a little short-changed by the lack of relaxation in the trio, although somewhat paradoxically, this made for relatively light relief in its games of counterpoint. Still, if one is not going to be Furtwängler, there is no point in straining for simulated ‘profundity’. One might say much the same about the slow movement. But could this really qualify as Adagio molto e cantabile? Cantabile, yes: it was lyrical throughout, flowing beautifully, if hardly plumbing the metaphysical depths. The lyricism was rapt in a fashion that recalled – or rather presaged – the slow movement of Mahler’s Fourth Symphony, a work in which Gatti has excelled. But ultimately I think it really was too fast for adagio, let alone adagio molto. Beethoven’s variation form was more clearly delineated than is often the case, with no sacrifice to the overall line. There was an unfortunate horn moment but these things happen. More troubling was the sense of a pleasant intermezzo, a harking back maybe to the Pastoral Symphony’s ‘Scene by the Brook’, instead of the revelatory experience that this movement can, or perhaps once could, provide. The finale began like the proverbial bat out of Hell, but should we not be vouchsafed a glimpse of Hell itself rather than a mere creature fleeing therefrom? There was, however, a nice hush for the initial ’cello/double-bass statement of the theme. Again, it flowed beautifully, though one might wonder whether that in itself is really the point. The intervention ‘O Freunde, nicht diese Töne!’ evinced a splendid sense of rhetoric. Unfortunately, superb as his – and the other soloists’ – diction might have been, David Wilson-Johnson was not so impressive at hitting the actual notes. Indeed, the soloists often seemed to put rhetorical values ahead of ‘purely’ musical ones. They also proved more than a little ‘operatic’ in an alien, Italianate sense. There is, I admit, a good case for discerning irony in Beethoven’s writing. As Stephen Hinton notes in an interesting article (‘Not “which” tones? The crux of Beethoven’s Ninth,’ in 19th-Century Music, vol.22 no.1 (Summer 1998), pp. 61-77), ‘the contamination of the instrumental music by operatic gestures and by words and the nature of those gestures – the recitative of the bass instruments and the baritone’s exaggerated melismas – all reinforce ... [a] sense of self-consciousness’ (p.69). This is not, however, what happened here. The soloists were not ironically operatic. The Ninth Symphony can justly be seen, in some though by no means all senses, to mark a staging-post on the road to Wagnerian music drama; it is certainly not a link between Beethoven and Verdi, or indeed Rossini, to whose music Beethoven nursed considerable antipathy. I have no such reservations, however, concerning the work of the London Symphony Chorus, which was, quite simply, stunning. The weight of choral tone was all one could have wished for and every word was not only heard but meant. There was an apt militaristic, marching character to the ‘Turkish’ music, which too often sounds merely bizarre. After that, the movement proceeded on its way, certainly exultant, often exciting. But is this all that the Ninth means or can mean to us today? What I fear is that we have, in a sense more monstrous even that of Adrian Leverkühn in Thomas Mann’s Doktor Faustus, revoked – or perhaps, worse, in this administered society, neutralised – its message. I pray that it will not require a second coming for Wilhelm Furtwängler to prove me wrong. The Royal Concertgebouw Orchestra’s two weekend concerts with Bernard Haitink afford London a slightly belated opportunity to celebrate Haitink’s eightieth birthday, which fell earlier this month. Mozart’s Haffner Symphony opened the present programme, in an excellent performance. (How rarely one can say that nowadays when it comes to Mozart!) The smallish orchestra – ten first violins, with other strings scaled accordingly – was not prevented from voicing a full sound, though that ineffable Viennese sweetness of tone was missing. Nevertheless, the bright, rejoicing sound of D major, open strings and all, was unmistakeably to be heard. The Concertgebouw strings offered commendable lightness of articulation without any of the fussy down-side that characterises so many modern performances. Clarity, Haitink, showed can easily be married to warmth, just as in his treasurable Glyndebourne DVD of Le nozze di Figaro. In every movement, the tempo sounded just right, which is not to say, as I once heard Sir Georg Solti absurdly claim, that, in Haydn and Mozart, there is only one correct tempo for a movement. Haitink, however, convinced us, for the duration of the performance, that this might be the case. He was not afraid, especially during the opening Allegro con spirito, to relax when the music suggested this. The Andante flowed with beauty and grace, light in the sense of an outdoor serenade, a quality further suggested by the ravishing Harmoniemusik. Repeated violin notes were sounded with precision, yet also with an affection that looked forward to Beethoven’s metronome joke in his Eighth Symphony. Resisting modern fads, Haitink took the minuet three-to-a-bar, much to its advantage. The tempo was not slow but it retained aristocratic poise. There was a welcome slight relaxation for the graceful trio. The Presto finale was lively without descending into an absurd dash, as so often it can. Here and throughout the symphony, the inner parts teemed with life. Splendid echo effects attested to the players’ virtuosity. Especially memorable was a delectable oboe solo from Lucas Macías Navarro. I was intrigued also to note the occasional string appoggiatura: not at all what I was expecting but tastefully accomplished. Debussy is another favourite composer for Haitink, his Concertgebouw recording of La mer a classic of the gramophone. There was a more audible precision to this 2009 reading; it evinced an almost Boulezian clarity, albeit without the impression of X-ray analysis. Certainly the opening of De l’aube à midi sur la mer had not the slightest sense of vagueness. This did not, however, detract from its mystery; there was most definitely a sense that something was about to happen. Woodwind solos from flute (Emily Beynon) and oboe (Navarro again) were breathtaking in their evocative excellence, as was Navarro’s beguiling duet with leader Vesko Eschkenazy. Throughout, Haitink judged orchestral balances to perfection, likewise the music’s harmonic momentum. Thus could the triumph of midday truly sound earned. Jeux de vagues was wonderfully playful, skittish even, a showcase for orchestral virtuosity, which yet always remained at the service of the music. Haitink unerringly caught the sense of the waves’ ebb and flow, and there were magical moments aplenty, not least from the two harps, triangle, woodwind, and the Concertgebouw brass. In the final movement, there was a sense not only of its titular dialogue between wind and sea but also of the battle between them. There was also, however, a great delicacy to be heard, which never veered towards the precious. The ravishing, seamless beauty of high violins provided a perfect setting for Jacques Meertens’s clarinet solo to weave its magic, its ‘winding down’ judged perfectly – once again – by Haitink, without ever sounding unduly micro-managed. I was a little surprised by the degree of vibrato employed by the brass, but it helped acknowledge the often overlooked Russian antecedents to Debussy’s music, Mussorgsky in particular. There was an especially imposing quartet of three trombones and tuba, which did not give the slightest hint of brashness. The final crescendo and accelerando were once again judged to perfection. Haitink has clearly re-thought his Beethoven, as we heard in his cycle of the symphonies with the LSO. Much of this has been to good effect, yet I did not find his account of the Seventh Symphony entirely successful; that said, my reservations related almost entirely to the final movement. That Haitink meant business was clear from the fact that his purposeful stride to the podium was followed almost immediately by a downbeat and then by a crisp opening chord, pristine woodwind very much to the fore. The introduction to the first movement was nicely persistent, possessed of an absolute surety of where it was heading; release was therefore attained with a minimum of fuss but far from a minimum of effect. Once again, one noted the care with articulation and balances, which yet never drew attention to itself in any of the bizarre ways that so often mar so-called ‘radical’ accounts. However, I found the trumpets a little too prominent. Sometimes, they pointed rhythms to great effect; at other times, they simply stood out to no particular reason. I could not quite work out what Haitink was trying to accomplish there. Ample compensation was provided by the ravishing woodwind solos in the recapitulation. The celebrated coda, of which it is alleged that Weber commented that it showed Beethoven ‘ripe for the madhouse’, provoked a continuous build-up of bass tension, albeit in a more understated fashion than one often hears. The Allegretto was at least as fast as in Haitink’s LSO reading. There was absolutely nothing of the dirge to this account, yet I wondered whether it was perhaps just too swift. In the end, I thought not, but it would probably be as well not to try this at home. The climaxes were truly awe-inspiring, born of and yet transcending the movement’s inexorable tread. This, then, proved a terrible processional indeed, although the turn to the major mode brought necessary consolation. The string fugato section presented an almost incredible contrapuntal clarity and direction. Rhythm was king in the scherzo, though it never sounded brutal, as it could, for instance, under Karajan. The trio was considerably faster than ‘tradition’ would have us hear it. There are swings and roundabouts here but the tension Haitink accrued could not be gainsaid. I especially liked the Harmoniemusik, which reminded us of the music’s origins, at least according to the Abbé Stadler, in a Lower-Austrian pilgrims’ hymn. A test of a good performance of this scherzo and trio for me is whether I become impatient with the repeats; I did not on this occasion feel even the slightest temptation to consult my watch. However, the ending had an odd sense of the throwaway to it. Sadly, as mentioned above, I was not at all convinced by the finale. It was very fast, which can work, but here the speed sounded as if it were allied to unsmiling application of an imaginary metronome. The trumpets, however well they played, did not help in this respect, once again unduly prominent in their underlining of the all-too-grim grim forward tread. I wanted the music to breathe but instead felt bludgeoned, not a feeling I generally associate with Haitink. Yet at the same time, he was curiously unwilling at the end to let the horns have their head, granting a paradoxical impression of ‘restrained bludgeoning’. The unrelenting quality of this movement might well have appealed to those who, incomprehensibly to me, favour the bandmaster approach of Toscanini in this repertoire. I was left hankering after Furtwängler. London buses spring to mind – an unusual reaction, I suspect, to so Viennese a programme: Schoenberg and Zemlinsky. But whilst Verklärte Nacht seems ubiquitous in terms of recordings, it had been a while since I have heard it in concert, or at least it had been until Tuesday’s Britten Sinfonia lunchtime concert. That, however, presented the original sextet version, whereas here we heard the second of Schoenberg’s orchestral versions, from 1943. I have always ultimately preferred the Brahmsian sound of the original, but there is certainly compensation in the sheer luxury of the sound from a full orchestral string section – such as Karajan’s Berlin Philharmonic, still to my mind the greatest orchestral recording, or, in a performance I heard a few years ago, the Vienna Philharmonic under Boulez. I have less frequently been convinced by the chamber orchestra approach: neither one thing nor the other, although I should make an exception for Heinz Holliger’s wonderful recording with the Chamber Orchestra of Europe, which manages to combine many of the best aspects of both. This, anyway, is a preamble to saying that Esa-Pekka Salonen wisely opted for a full complement of Philharmonia strings. Did this choice pay off? On the whole, yes. I have little to quibble about in terms of the orchestral performance. These are not, of course, the strings of Vienna. Nevertheless, any hint of thinness was but fleeting; indeed, there was often a truly Brahmsian richness, not least in the tremolo passages from double basses and ’cellos. On occasion one even heard a sweetness suggestive of the ‘City of Dreams’, which gives its name to this concert series. There were more than a few hints of Mahlerian neuroticism, for instance in the increased intensity of vibrato upon certain notes. The solo work of leader Zsolt-Tihamér Visontay was as aristocratic as we have come to expect but no less noteworthy for that. What reservations I had, and I should not wish to exaggerate them, relate to Salonen’s interpretation rather than the Philharmonia’s execution. The work was played very much as an orchestral piece, which is fair enough, and sounded very much conducted, which of course it was. I liked very much the Nordic cool imparted to the opening bars but the race was a little frantic towards the hothouse and I am not sure that the latter should really have been our destination. We are concerned, after all, with a moonlit forest, both literally and symbolically. Sometimes, the reading sounded a little too consciously moulded; art is often better employed to conceal art. The often extreme shifts of tempo worked better on some occasions than others, though it is only fair to note the considerable excitement of the faster, almost operatic passages. Where I felt short-changed was in the relative lack of transfiguration. The final section lacked that sense of elevation, programmatic and tonal, which the finest performances will variously impart. Salonen’s superlative Gurrelieder was always going to be a hard act to follow. Nevertheless, the conductor managed to do just this in Zemlinsky’s Lyric Symphony. This work, I think, is close to a masterpiece; there is true greatness to be heard here – and heard it was. Schoenberg, no less, opined in 1949: ‘I always firmly believed that he was a great composer and I still believe this. It is possible that his time will come sooner than we think.’ Salonen could well be the man to make sceptics reconsider, for there could be no doubt from this performance that, unlike the increasingly bizarre claims heard from a vocal gang of Korngold devotees, Schoenberg’s words are worth considering, even if ultimately they might transpire to be a little generous. The Royal Opera would certainly be better off considering a Zemlinsky sequel to Die tote Stadt rather than reviving the ludicrous Das Wunder der Heliane, a work heard in all its dubious glory a little over a year ago from the London Philharmonic under Vladimir Jurowski. Where Korngold, even at his best, conjures up effect, Zemlinsky clearly means what he says in the Lyric Symphony. From the fatalistic opening, with its crucial motif intoned by three trumpets and three trombones, underpinned by crashing rolls on the kettledrum, to the very end, the commitment and accomplishment of Salonen and the Philharmonia could not be faulted. The orchestra in this work is, after all, a truly Wagnerian Greek Chorus. Febrile strings imparted menace to the introduction but could just as easily be transformed into purveyors of a late-Romantic outpouring of love. Solo passages, from wherever they came in the orchestra, were uniformly excellent. Paul Edmund-Davies’s flute arabesques, which accompanied the textual evocation of his instrument – ‘O fernstes End, o ungestümtes Rufen deiner Flöte!’ – would have taken the listener anywhere this Pied Piper might have led him. In the second movement, Visontay’s opening violin solo was just as it should be: skittish and sweet. A little later, we heard the girl’s chain crushed under the wheels of the Prince’s chariot: a vivid piece of tone-painting from the lower strings. The thrilling vocal and orchestral climax that followed not only impressed in itself but also led us with flawless symphonic ease into the third song. Motivic development was always surely attended to, here and elsewhere. Elspeth Dutch’s horn solo in ‘Du bist die Abendwolke’ was truly melting, whilst in the following, fourth movement, Visontay and David Cohen presented an almost Bergian duet, which warned us all too clearly of the perils and indeed madness of Romantic love. The nauseating orchestral fantasy that followed was Klimt-like in its colours, celesta (Shelagh Sutherland) and harp (Hugh Webb) especially worthy of mention. This was, of course, a wicked, pleasurable nausea, and all the more discomfiting for that. Salonen captured masterfully the furious scherzo-like onslaught of the fifth movement, its outburst of violence over in a flash, before Mahlerian violas and two trombones offered illusory consolation in the introduction to the sixth. The sense here of still desolation was eerily captured by the ever-present pedal on the double-basses, played here to ominous perfection, granting an apt sense of claustrophobia to this horrifying movement. And when the orchestra was once again truly given its head in the postlude to the final movement, it sounded unambiguously magnificent, as if this were a work that featured as a staple of its repertory. This is, of course, a lyric symphony, so what of the voices? Juha Uusitalo took a while to settle, his intonation somewhat wavering in the first movement. However, by the time of the third, in which he reappears – soloists sing in alternate movements, never together – his voice sounded cleaner and winningly ‘honest’, the latter quality intriguingly suggestive of Wagner’s Fasolt. Uusitalo’s diction was perfect throughout; if his German were slightly accented, as often seems to be the case from even the most celebrated of low Finnish voices, one could nevertheless hear every word without the slightest strain. I was also impressed by the Lieder-singer’s attention he devoted to words and their meaning. Intonation was not always spot on in the final movement but nor was it unduly troubling. Solveig Kringelborn was rapt in her lyricism, equally attentive to the dictates of musical line and verbal meaning. It is more difficult, of course, for a soprano to render every word audible, but she did not fare badly on that score. There was again a welcome sense of the Lieder-singer to her reading. Indeed, so involved was she with the text that she could not resist a little operatic throwing of her ruby chain as the Prince passed by her door. Conscious or no, it was a special moment. And this was a special performance. 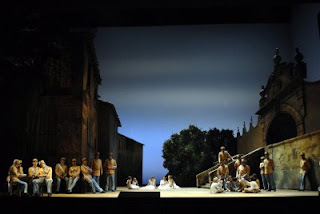 This was to have been a new production of Carmen at the Deutsche Oper, the first since 1979. Sadly, illness on the part of director, Jürgen Gosch intervened, so the house was compelled to revive, under Søren Schuhmacher, Peter Beauvais's thirty-year-old production, with not so much as a Konzept in sight. Reactionaries and cynics would doubtless wish, or at least claim to wish, that such a setback might happen more often, but I am afraid that the prettified naturalism of the sets looked, unsurprisingly, tame and dated. Maybe I have been corrupted by my experience, good or otherwise, of more adventurous modern productions; this, however, seemed more akin to the world of musical comedy – and not in the original sense of the Paris Opéra Comique. Nothing was harmful; by the same token, there was no especial insight afforded into the work. The production had its moments. Costumes, particularly the soldiers’ uniforms, were well designed. The dark mountain setting for the third act was considerably more effective than the other mises-en-scène. I thought the crowd scenes ably directed, something one certainly cannot take for granted in terms of contemporary stagecraft. It was good to have no apology made for twin bêtes noires of liberal fascism: cigarettes and bull-fighting. The management of the Deutsche Oper had of course been place in an impossible position; this course was certainly far preferable to cancellation. Those who lament current directorial trends could do worse, however, than sample a few precursors and to recognise that it takes a producer of true genius – Patrice Chéreau springs to mind – to present something that will not quickly date. Better this, however, than the mindless populism of Francesca Zambello’s ‘West End spectacular’ approach for the Royal Opera; quite apart from the latter’s sheer untimeliness, at least with respect to anywhere east of the Met, it inflated Bizet’s opéra comique into something quite alien. There was, in general, an intimacy to the Beauvais-Schuhmacher production that worked well on its own terms. Angelika Kirchschlager’s Carmen would, I suspect, have been the principal attraction for much of the audience, even had this not been a revival. There were a few moments in which she let her acting get the better of her vocal skills, but hers remained a keenly observed portrayal. Indeed, for the most part, stage presence and singing could not be disentangled, which is just as it should be. There was sexiness aplenty in the first two acts, without ever descending into a loss of dignity. Moreover, one could feel keenly the fatal transformation in Carmen’s character by the fourth act. Massimo Giordano projected both ardour and weakness as Don José. His is an impressive voice although, in repertoire such as this, he would do well to suppress the Italianate sob that too frequently intervened here. Still, one could readily relate to his anguish, even if it occasionally veered a little close to melodrama. Michaela Kaune offered a beautifully sung Micaëla. The smaller roles were generally well taken, Andrew Ashwin proving an especially winning Moralès; his career should be one to watch. And the children’s chorus was deservedly cheered; this was an estimable contribution indeed. The only real disappointment was Raymond Aceto’s Escamillo. Although he had a certain swagger on stage, it was never matched by his generalised vocalism and sometimes uncertain intonation. It was difficult to understand why Carmen might have chosen him. Yves Abel handled Bizet’s score well, if without the fire that marks out the more notable interpretations. Care had clearly been taken to make the orchestra sound credibly French, not least when it came to some delectable woodwind solos. A notable instance was the flute solo in the second entr’acte, although sadly a sustained barrage of coughing ruined what should have been a truly magical atmosphere. Abel showed sound judgement in eschewing Ernest Guiraud’s once fashionable recitatives in favour of the original spoken dialogue. The conclusion, however, was disappointingly low-key, seeming rather to fizzle out from exhaustion. This was not a Carmen for the ages, but it marked an impressive debut for Kirchschlager and, especially given the difficult circumstances, should be accounted a success for the company. Perhaps expectations were always going to be too great for a Berlin Parsifal, conducted by Daniel Barenboim, with a cast to include Plácido Domingo, Waltraud Meier, René Pape, and Hanno Müller-Brachmann. Fate dealt a blow, in that René Pape was unable to sing, yet he was replaced by Matti Salminen, testament surely to the standing both of Barenboim and the Staatsoper Unter den Linden. There were many good things about this performance, yet it did not really live up to the height of my expectations, partly on account of a production that not only failed to make sense but often distracted from the music. Meier was her usual excellent self, here given a far better opportunity to display her strengths than in the Paris Opéra’s Tristan, when I had last seen her. One could not only hear but see that she meant every word, even every stage movement. The three very different Kundrys of the three acts were both differentiated and yet recognisably incarnations of the same character, perhaps Wagner’s most intriguing of all. Müller-Brachmann was – and this is high praise indeed – an equally astonishing Amfortas. One felt his anguish almost as if it were one’s own; moreover, one understood why it had to be. Not only was every word audible and meaningful; it related intimately to the musical text, as did that to the words. Christoph Fischesser was an excellent Klingsor: malevolent yet no cartoon villain. His presentation of the text, musical and verbal, allowed one once again to understand why he had taken that truly fateful step of his. 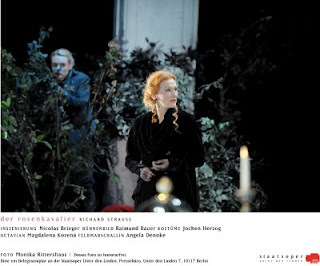 The smaller roles were well taken, not least the doubling up as Flowermaiden and Squire from rising young star, Anna Prohaska, recent recipient of the TheaterGemeinde Berlin’s Daphne-Preis. Her diction, like that of most of her colleagues, was as impressive as her command of line. The circumstances of Salminen’s participation made his task difficult. For the most part, he and his unmistakeable voice rose ably to the challenge. His diction was, if anything, almost too pronounced, but if a fault that be, it surely errs in the right direction. There were quite a few instances, however, of uncertain intonation, partly a result of an extremely wide vibrato. 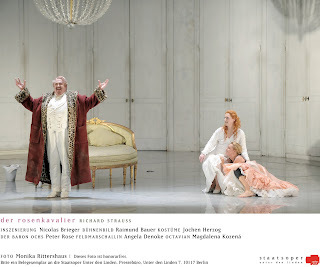 I was surprised also by the relative thinness – certainly relative to several other performances I have attended at the Staatsoper – of the choral sound. The choral contribution was not bad but nor did it constitute the jewel that it has often proved. Barenboim was on very good form. There were occasional instances, notably in the third act, when I thought that transitions were a little disruptive. The absolute inevitability of everything in, for instance, Bernard Haitink’s Covent Garden performance was not quite attained, but Barenboim was not so very far off; for in general, this was a commanding traversal of a score he knows so well. 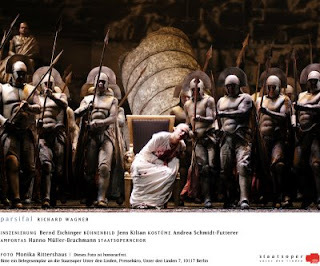 Unlike many conductors, unthinkingly praised in some quarters for ‘consideration towards the singers’, Barenboim knows that the real drama lies at least as much in Wagner’s Greek Chorus, the orchestra, as on stage; if the singers cannot cope with Wagner’s orchestra, then they have no business singing Wagner. Not only does the drama lie therein; it is here that that drama is bound together through the density, both complex and yet possessed of a mediated immediacy, of the motivic connections and transformations. For this truly to work, one needs a great orchestra. Barenboim’s Staatskapelle Berlin did not disappoint. The depth and richness of its string tone present an object lesson to any orchestra, anywhere. One heard with pleasure, and sometimes with horror, a great deal of woodwind detail that can sometimes be submerged, and the brass provided an especially valuable contribution to the baleful ritual of a dying community. However, Bernd Eichinger’s production seems to me fundamentally misconceived. Eichinger thinks of the work as an essay in time-travelling. So far as I can tell, this arises from a misunderstanding of Gurnemanz’s celebrated line, ‘Here space becomes time’, a line with philosophical roots in Schopenhauer, and beyond him, Kant. I assume that Kundry’s reincarnations are also involved in the misconception. It might have worked, I suppose, even if it were not what Wagner was thinking of. Yet even on its own terms, Eichinger’s Konzept is confused. The action moves from one time and location to another, rather as if Wagner had scripted a few episodes of Doctor Who. Some are more sharply defined than others, which come across as more of a mishmash. Andrea Schmidt-Futterer’s often bizarre costumes did not help in this respect. Many of the settings seemed merely arbitrary. There seemed no especial reason why images of the Industrial Revolution should accompany Kundry’s kiss, nor why Gurnemanz, in Act III, should awaken as a tramp on a park-bench in what appears to be mid-twentieth-century Manhattan. More problematic, however, is the fact that sometimes the characters perform against a mere scenic backdrop, whilst other instances, such as the mildly futuristic final scene, have them interact with what appears to be a real time and place. That scene appears to take place after some variety of bombing – seen on film – and is populated, for some reason, by a slightly menacing gang of bikers (the chorus). It is not that the production does not have its isolated moments. The master-slave dialectic between Klingsor and Kundry presents a chilling, dramatically credible opening to a second act that then fails to live up to such promise. Whilst I could not quite work out intellectually why Amfortas tears out his heart for the knights to consume during the previous act – perhaps, I wondered, a violent twist to a Feuerbachian understanding of the elements in Holy Communion – there is a disturbing, powerful quality to what we see; it does not, however, seem to have any connection with anything else. Likewise, the contributions of fettFilm are in themselves of a typically high quality; it is a pity that they are not married to a more convincingly thought through production. This is a far cry from the astonishing achievement of Stefan Herheim’s Bayreuth production last year. The good news, however, is that Herheim will be producing a new Lohengrin at the Staatsoper next month, conducted by Barenboim. I shall report back.